On a November morning, Heather Light was teaching second and third graders about composting, a natural process of decomposing organic matter. Light, who teaches art and gardening at the School of Arts and Sciences (SAS) at The Centre, had asked students whether meat should be composted, and many responded with a loud “no!” Together they made a list of compostable items, contributing suggestions ranging from eggs to banana peels. The kids headed from their fluorescent-lit, indoor classroom to the roof, and atop the building that once housed department stores, they crowded around a compost bin to observe several cubic feet of rich soil filled with worms wriggling in the bright autumn sunshine. The school opened in July 2016 and continues to evolve along with the mall that surrounds it. Victor Gruen, the architect who designed America’s first enclosed shopping mall in 1956, viewed it as a kind of “third place,” separate from home and work, and a center of public life. Since the ’60s and ’70s, closures of brick-and-mortar stores, especially big anchor tenants, have turned hundreds of shopping centers across the country into greyfield sites, a category that by some accounts applied to the Tallahassee Mall before its rehabilitation into The Centre of Tallahassee. Gruen’s ideal of the shopping mall as modern-day town square may be a failed vision. Or is it? Gruen’s original plan included apartments, medical centers and schools among the retail stores. At The Centre of Tallahassee, a village of businesses has sprung up around the cobblestone drive leading up to the school: Lemongrass, a Thai restaurant; Urban Food Market, a group of Italian eateries; a nail salon; and BodyTrac Health & Fitness. In 2013, the SAS board of directors approved a new campus at The Centre and, in 2015, named one of its teachers, Lindsey Merrick, to serve as principal. SAS opened as a public charter school in 1999 and has since graduated thousands of students from its Thomasville Road location. Merrick remembered that the waiting list to get into the school was long. “The board wanted to serve the community at a greater level,” she said. Merrick recalls the first year, when there was no playground for the school’s 150 students. Although The Centre location carried over the same students and many of the same staff, to Segerstam-Ivey, who was then a teacher, it felt like opening a new program. “The procedures were brand new,” she said. “I used to tell people starting the school was like building a plane while it was flying,” Merrick said. The school began with three classes, kindergarten through second grade. As the oldest class grew into a new grade, so did the school. The current student body of approximately 260 students encompasses kindergarten through fourth grade. Phase One was completed for the location’s opening in 2016, followed by Phase Two, which houses fourth grade classrooms, and soon, fifth grade. As of now, Phase Three, which will need to be open in two years for its first class of sixth graders, remains a dark shell of dusty concrete and exposed beams. “The whole building looked like this,” Merrick said, referring to the first time she saw the site that would one day become SAS at The Centre. Last year, SAS at The Centre received a school grade of “A” from the Florida Department of Education. It’s an achievement of which the teachers, staff, students and parents are proud. 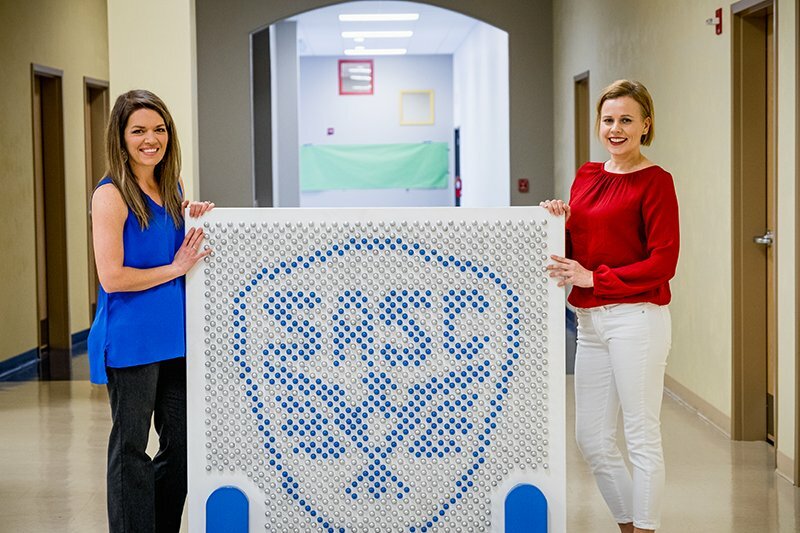 The curriculum at SAS at The Centre is known as project-based learning, or “teaching through themes,” where all the teachers organize their academic lessons around themes like U.S. history or space exploration instead of a textbook or chapter. Teachers also apply a classroom management and social-emotional intelligence program called conscious discipline. “We practice with students how to let others know the way they want to be treated, how to disagree in a respectful way,” said Segerstam-Ivey. Another aspect that makes the school special, according to administrators, is the sense of family. Children consider themselves “school sisters” and “school brothers,” and teachers are known as “safekeepers” for their role ensuring student safety. Classroom instruction at SAS at The Centre is focused on small-group work. Instead of a teacher leading all of the students in a single activity, students receive explicit instruction from teachers and also have the opportunity to work independently on projects and other activities on their skill level. In all grades, two certified teachers supervise each classroom of 26 students. Music is combined with movement by teacher Matt Harmon, who leads the kids through clapping out the notation displayed on a large electronic board. Harmon also helps students explore a variety of child-sized instruments. The whole school assembles each week for Friday Sing, where each class has a chance to share its current theme project. Merrick and Segerstam-Ivey said that locating the school at the mall required extra attention to procedures. “It means frontloading information to families. There is continuity as well as consistency in procedures across the school. 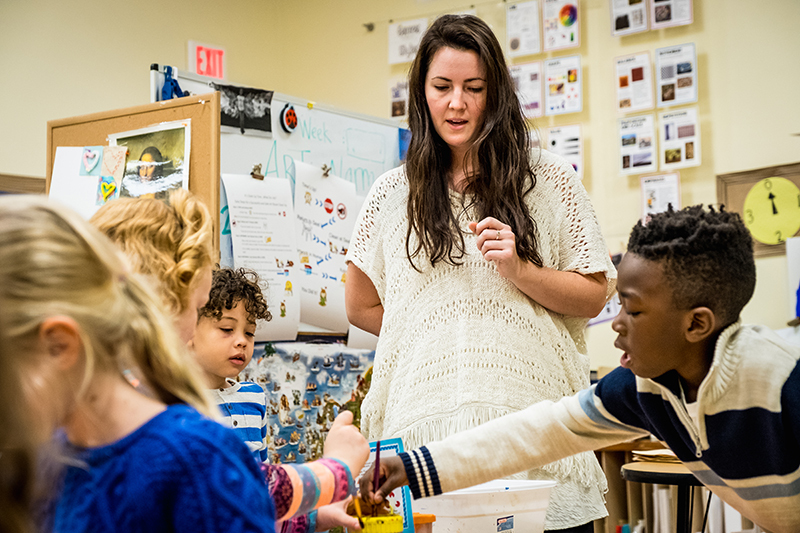 The way a kindergarten teacher gets the attention of students is similar to the way a fourth-grade teacher gets student attention,” Merrick said. As an additional safety measure, students wait in classrooms until pick-up, and there is only one point of entry for all students, staff and visitors. “It’s our goal to be a hidden gem,” said Segerstam-Ivey. The Centre of Tallahassee is not the only shopping mall with unusual tenants. In places like Nashville and Mesa, Arizona, shopping malls have incorporated libraries, college campuses, medical centers and offices into former retail space. Back on the roof, children taking a physical education class screamed and chased one another across the AstroTurf in an impromptu game of tag. From the garden nearby, a boy shouted, “Let’s name him Eddie!” The second and third-grade gardeners were still learning about composting and giving thoughtful consideration to names for the working worms.